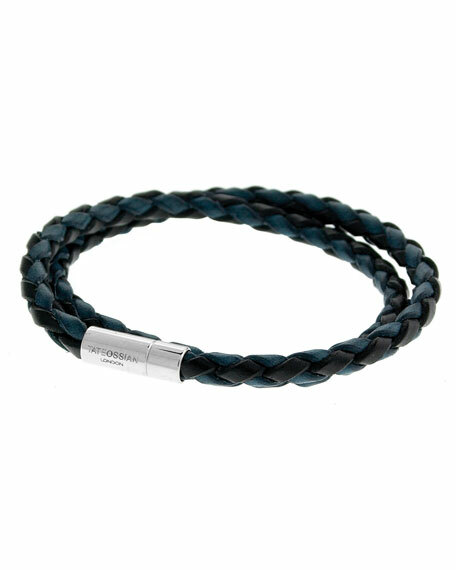 Tateossian wrap bracelet in braided leather. Nylon cord. Solid silver with woven chain texture. Turquoise and matrix beads. Size M; adjustable to L. Width, 4mm. Handcrafted in Bali. From the Bamboo Collection and the "Wear Bamboo, Plant Bamboo" initiative. The purchase of this bracelet ensures the sowing of 1 bamboo seedling by John Hardy. Woven leather wrapped to form three straps. Sterling silver bamboo detail on center strap. Handcrafted in Bali.